Play Club Casino launched in 2017 and offered online players a brand new entertainment destination where every wager counts. From the moment new members start playing, they are part of the rewards system that awards generous points and rising through the VIP levels enables every player to reap astonishing benefits. Play Club Casino offers a fabulous variety of top games, and its collection caters for all players from slot enthusiasts to blackjack pros and professional dealers host its great range of live casino games. Safety, security, and privacy are high on the casino's priority list, and members can enjoy gaming with confidence since all software are tested and certified by ITech Labs. Member support is offered via telephone, email and live chat and languages offered include Swedish, Norwegian, German, Finnish and English. Play Club Casino offers new players an awesome start, and its lavish welcome offer includes a 100% match bonus up to $200 plus 100 free spins. The welcome offer is spread out across the first three days of play starting off on day one with a 100% match bonus plus 20 free spins, day two offers 40 extra spins to your playing session, and on the third day, another 40 free spins are added plus an extra bonus surprise. All offers are activated with a minimum deposit of £10, and free spins are to be used within 24 hours. The welcome bonus and deposited amount are subject to wagering of 40 times within 21 days of activating the bonus before withdrawals can be requested. Members at Play Club Casino enjoy several exciting promotions, which includes the daily bonuses, monthly cashbacks, and free spins fests. 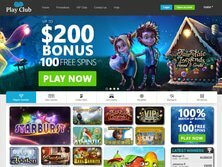 Currently, the casino does not offer any no deposit bonuses, vouchers or coupons although several surprise bonus offers are mailed to all members on a regular basis. Play Club Mobile Casino can be accessed on all mobile devices including iPhone, iPad and Android devices and no app downloads are required. Mobile users enjoy the same bonus benefits as desktop players and also benefit from the loyalty points. Several tiers are part of the VIP Club, and bonus offers, free games bonuses, and personalized offers increase according to members VIP status. Several banking methods are accessible to Play Club Casino members and include Ukash, Skrill, Visa, MasterCard, Paysafecard, iDEAL, sofort, Neteller, Entropay, Maestro, Trustly, Zimpler, Aktia, Euteller, Fast Bank Transfer and ECO. Currencies accepted include €, £, AU$, $, C$, and R$, while withdrawal times for credit cards takes six up to 8 business days and Skrill, Ukash, and Neteller withdrawals can be expected within three business days. The largest areas that seem to be popular with the casino are Canada, the U.K, and various others. As this casino is still in its early stages of operation, exact countries and the extent of their popularity in specific countries is unknown. Play Club Casino's amazing gaming collection includes player favorites, video slots, new games, live casino, blackjack, and roulette powered by NextGen Gaming, NYX Interactive, NetEnt, LightningBox, Evolution Gaming, Microgaming, and NeoGames Technologies. Player favorites include Fruity Friends, Witch Pickings, Atlantis, Jack And The Beanstalk, Warlords: Crystals Of Fortune and Super Graphics Upside down video slots, while players also enjoy regular play on Blackjack Live and VIP Blackjack. New games include Fireworks, Pentagram, Grim Muerto and Thunderstruck II, while slot players also have access to branded video slots such as Jimi Hendrix, Game Of Thrones, and Bar Bar Black Sheep. The live dealer section offers seven different options including Roulette Live, Baccarat Live, Immersive Roulette, Blackjack Live, Roulette VIP and Blackjack VIP. Table games available include Blackjack Party, Roulette Royal, European Roulette and Roulette Pro. A large variety of scratch cards are available and include Fantasy Forest, Read. Set, Go, as well as Summer Fun and Lucky Eggs. At this stage, being a newer casino, jackpot winners are unknown.That is not to say players have not experienced large jackpot wins at the casino, just that locating specific jackpot winners is unavailable. Play Club Casino do not offer a separate category for progressive jackpots although the collection does include NetEnt's Cosmic Fortune that features five jackpots. As Play Club Casino only opening in 2017, we were unable to locate any complaints. However, when you consider its licenses and the trustability behind those licensing bodies, it is not expected to see many complaints about this casino in the future. 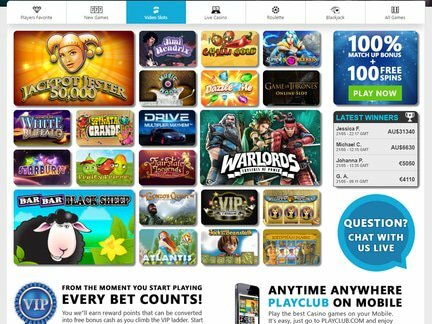 All games on the Play Club Casino website is powered by Aspire Global International LTD, which also operates the website and is licensed and regulated by the Malta Gaming Authority. No US players are accepted, and member assistance is offered daily from 8 am to 1 am CET. Play Club Casino is a brand new casino, and there is no doubt that it will soon feature a much larger gaming variety and hopefully a great selection of progressive jackpots. Assistance if offered via phone, email, fax and live chat and during the operating hour's replies are almost instantly.